A DANGEROUS CHEMICAL COCKTAIL — The chemicals in Monsanto’s Roundup are seeping into our waterways, backyards and even the food we eat, putting our families and the environment at risk every day. We’re calling on the Environmental Protection Agency (EPA) to ban Roundup unless and until it’s proven safe. Most of us take it for granted that the food we buy for our families and the grass our children play on at a nearby park are not putting our health at risk. But new research, including some done by the World Health Organization (WHO), has found that Monsanto’s Roundup and other glyphosate-based herbicides could pose significant risks to human health. Just how serious is the risk? The jury is still out, but there is cause for serious concern. One study by the WHO linked glyphosate — the main chemical ingredient in Roundup — to cancer at high levels of exposure. Another WHO report said the actual risk given probable exposure to glyphosate was minimal. Multiple studies have found herbicides like Roundup were more likely to cause cell-cycle dysregulation, a hallmark of cancer, than glyphosate alone. A 2009 study showed that some formulations of Roundup were more toxic to human umbilical, embryonic and placental cells than glyphosate by itself. Another study found that one of the inert ingredients in Roundup was up to 2,000 times more toxic to cells than glyphosate. It’s clear — we shouldn’t be exposing ourselves to something that has the potential to cause such harm. But it’s the fact that Roundup and similar herbicides are so widely used that makes this a serious threat to public health. Millions of people regularly use Roundup in their backyards, and it’s commonly sprayed in areas where kids play and learn, like public parks, school playgrounds and sports fields. But an overwhelming majority of the glyphosate used in America is on farms. That’s because Monsanto has engineered “Roundup ready” crops that are designed to withstand the chemical while still killing unwanted weeds. The problem, however, is that these weeds have grown resistant and developed into “super weeds.” Not surprisingly, the response has been to increase the dosage and frequency of Roundup used on crops. The result? Glyphosate is now the most widely used agricultural chemical in U.S. history. Nearly 250 million pounds of the chemical are sprayed on U.S. farms every year! And since it was introduced in 1974, 9.4 million tons of glyphosate have been sprayed worldwide. Meanwhile, Monsanto continues to back the herbicide. 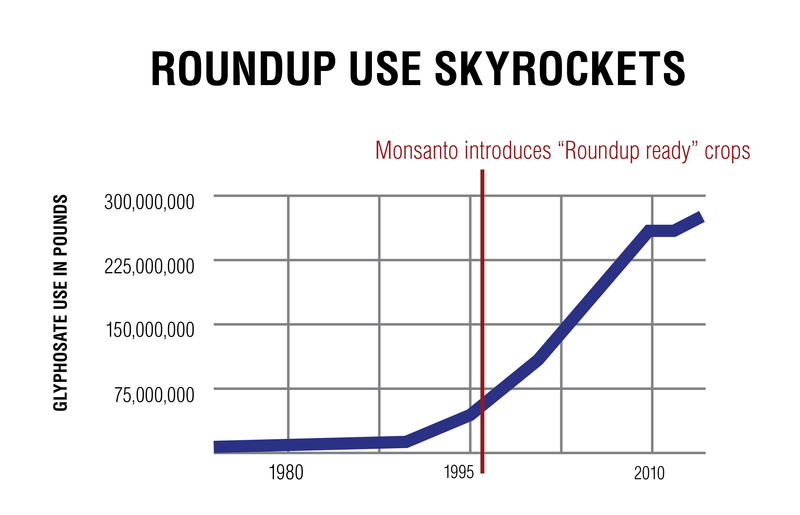 At one time Monsanto claimed that Roundup was biodegradable. Studies show a different story, however, as these chemical ingredients are starting to show up in our food and bodies. A recent study discovered traces of glyphosate in the urine of 93 percent of the people they tested. It’s even showing up in foods like soy and beer. This is not a sustainable solution, and with the mounting evidence clearly showing the dangers of Roundup, it’s time to take action and ban Roundup unless and until it’s proven safe. It’s absurd that a weed killer — designed to make our lives more convenient and food production more efficient — should be allowed to put public health at risk. We know there are safe ways to get rid of weeds, including simple crop rotations, following organic farming practices, or just yanking them out of the backyard. It’s time to ban Roundup. But Monsanto is not going to make it easy. Despite the growing body of evidence to the contrary, Monsanto is still saying Roundup is safe, and they are hard at work trying to convince the EPA that no further testing is required, and no restrictions on its use are needed. So far, the EPA has been receptive to Monsanto’s aims — not that long ago they increased what they considered to be a safe level of glyphosate. We need your help to call on the EPA to ban Roundup unless and until independent research proves it’s safe. On holidays, most of us like to shop or grill or visit grandma or the in-laws. There’s nothing wrong with that. But it’s good for our souls to take a moment to remember the meaning of each holiday. Consider Earth Day. Consumer and public health advocacy organization U.S. PIRG Education Fund is calling on Wendy’s to stop serving beef raised with the routine use of antibiotics. The U.S. PIRG Education Fund and its partner groups are calling on the third-largest burger chain in the United States to follow the lead of its rival, McDonald’s, which recently announced a detailed antibiotics policy for its beef supply chain. For the past thirty years, our sister organization U.S. PIRG Education Fund has taken a close look at the safety of toys sold in stores. Their reports have led to more than 150 regulatory actions. In November 2015, they released our 30th annual Trouble in Toyland report. In our democracy, the size of your wallet shouldn’t determine the volume of your voice. In 2015, we helped win reforms in Maine and Seattle to ensure that more Americans have a greater say in our elections. Seattle’s Initiative-122 empowers small donors with “democracy vouchers” that can be donated to local candidates and lowers the cap on contributions. In Maine, the state’s Clean Elections Act was improved by strengthening campaign finance disclosure laws and offering qualifying candidates increased public funding. In 2015, bolstered by the support of more than 100,000 members and supporters, we convinced both McDonald’s and Subway to take action to protect public health. In March, just two days after we delivered more than 30,000 petitions to McDonald’s headquarters, the company announced that they would stop serving chicken raised on medically-important antibiotics. And in October, after more than 100,000 called on the chain to take action, Subway announced a similar policy for all the meat they serve. We helped win protections for students from unfair fees associated with campus bank accounts. The new rules, released by the U.S. Department of Education, ban some of the worst and most predatory fees that students encounter from banks. With this Safer School Supplies: Shopping Guide, parents, teachers, and students can make more informed decisions while shopping for school supplies this Back to School season. We want to give parents and teachers the option to choose school supplies that do not contain toxic chemicals. This Shopping Guide should serve as a handy tool for finding products free of several types of toxic chemicals. Your plane is ready for boarding. Safety is optional. How can it be that, in 2019, critical airplane safety features could be considered optional—or worse, be available only at a steep extra cost? We know that we pay some of the world's highest prices for medications. But why should the price we pay for the same medication be dramatically higher at one pharmacy than another? We're calling on the EPA to ban Monsanto's Roundup unless and until independent research proves it's safe. Let's hold them accountable.